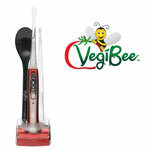 We want you to be delighted with your decision to own a VegiBee. Please reach out if there is anything we can do to improve your experience or results. Learn the best practices for using the VegiBee with a digital owner’s manual. Download resources that will help you get more our of your VegiBee. Register your VegiBee and understand how the warranty works. Get instructions on the proper way to return or exchange your VegiBee. Find helpful tips and instructions to get more from your VegiBee. Press the on switch to begin the wand vibration. Use the up and down buttons to change the speeds on the VegiBee™ garden pollinator. Press the off button to stop the vibrating wand. 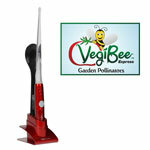 Return the VegiBee garden pollinator to the charging base when not in use. Turn unit off. Rotate the wand ¼ turn to the right and lift from the unit. Install the new wand. Align the groove on the wand with the ridge on the pollinator. Gently rotate the wand ¼ turn to the left until it clicks in place on the pollinator. Do not attempt to attach the pollen spoon to the pollinator. Turn the unit off. Place the pollinator charging base on a flat surface. 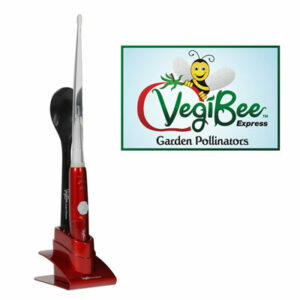 Place the VegiBee garden pollinator in the charging base. Connect the USB connector into a computer, or use the AC adapter. Prior to initial use, charge the unit for 12 hrs. with the AC adapter and 16 hours with a computer. Use a clean, damp cloth to clean the unit, then dry the unit before charging. Do not use chemicals or alcohol on the unit. Do not immerse the unit in water. The unit will shut off after 2 minutes. Keep the pollinator indoors when not in use. Heat and cold, as well as humid conditions, will shorten the battery life. Do not use the pollinator for any other use, except pollinating plants. When not in use, leave the pollinator on the charging base. Keep the pollinator out of the reach of children at all times. Press the ON/OFF power button to turn the wand on. Press the ON/OFF button to turn the vibrating wand off. Return the VegiBee garden pollinator to the charging base when not in use. Turn unit off. Rotate the wand ¼ turn to the right and lift off the pollinator. Align the groove on the wand with the ridge on the pollinator. Gently rotate the wand a 1/4 turn to the left until it clicks into place. Do not use the spoon on the pollinator. Remove the vibrating wand from the pollinator. Unscrew (counter clockwise) the battery cover from the lower half of the pollinator. Remove the battery from the pollinator. Install a fresh AA alkaline battery. Position the negative side of the battery towards the top of the pollinator. Re-install the battery cover, screwing the cover on (clockwise). Do not over tighten. Download these resources about your VegiBee. If you are not satisfied with the VegiBee garden pollinator within 30 days of the original purchase receipt, you may return it. The VegiBee garden pollinator must be in the original condition and must contain all of the parts and packaging. If you receive a VegiBee garden pollinator that is missing parts, damaged or defective, you must contact the VegiBee.com within 5 days of receipt, to correct the issue. Return shipping cost will not be refunded by the VegiBee Co. unless the unit was defective. Return the unit pre-paid by UPS or FedEx. We do not accept returns that are mailed COD. Save your mailing receipt and tracking number for proof of return delivery. We are not responsible for packages that are lost or damaged by the return shipping company. Your credit card will be credited within 15 days after your return has been processed. If you paid by check, a refund will be mailed to you within 15 days after processing the return. Tell us about your results with the VegiBee!